A 22-year-old man, Eric Boakye, who lives at Asokore, a suburb of Koforidua, is decomposing on a daily basis for allegedly using his one-and-half-year-old son for money rituals. Daily Guide gathered that Eric Boakye had two kids. For three years he worked in Accra as a washing bay attendant but last year December he returned to his family house at Asokore in Koforidua. 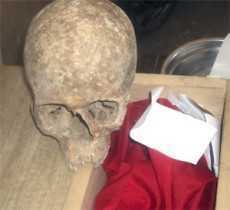 Sources said Eric Boakye then took his one-and-half-year-old boy to a popular fetish priest at a shrine near Kumasi in the Ashanti Region and used him for money rituals. Daily Guide learnt that the financially frustrated man had told his family in Asokore that he was taking his son to a family member at Kumasi to spend the Christmas vacation there but never returned with the kid to Asokore to continue schooling. Eric Boakye, as gathered, was instructed by the fetish priest to hit his son with his two hands so that he would become deaf. According to reports, the fetish priest claimed Boakye’s son would then begin decaying on a daily basis, which would generate money for Boakye. Eric Boakye, after performing the other necessary rites at the shrine, did what the fetish priest instructed him to do but the son didn’t turn into a deaf person. Rather, he started barking like a dog, collapsed and died on the spot. Boakye, according to a family source, then buried his son in the bush without telling anybody. Daily Guide learnt that last month February Eric Boakye started growing boils on all parts of his body and the family questioned him about it but he failed to answer. Members of the family then went to a different fetish priest for consultation and were told that Eric had taken his son to a fetish priest for money rituals but didn’t succeed and that it had resulted in his son’s death. Eric Boakye later confessed but failed to give out the location of the fetish priest. 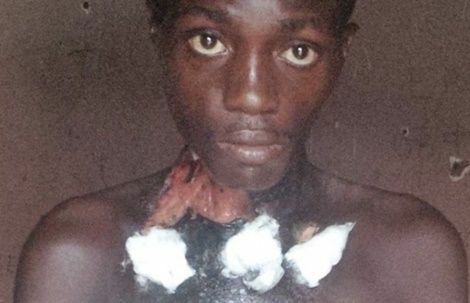 His body then started rotting, emitting an offensive stench which has forced all the co-tenants, except the family members, to vacate the family house at Asokore. The worried family, as gathered, has not taken any decision as to whether to send Eric Boakye to the fetish priest for help or take him to the hospital. However, the issue which has spread like fire in the New Juaben Municipality has shocked most residents.